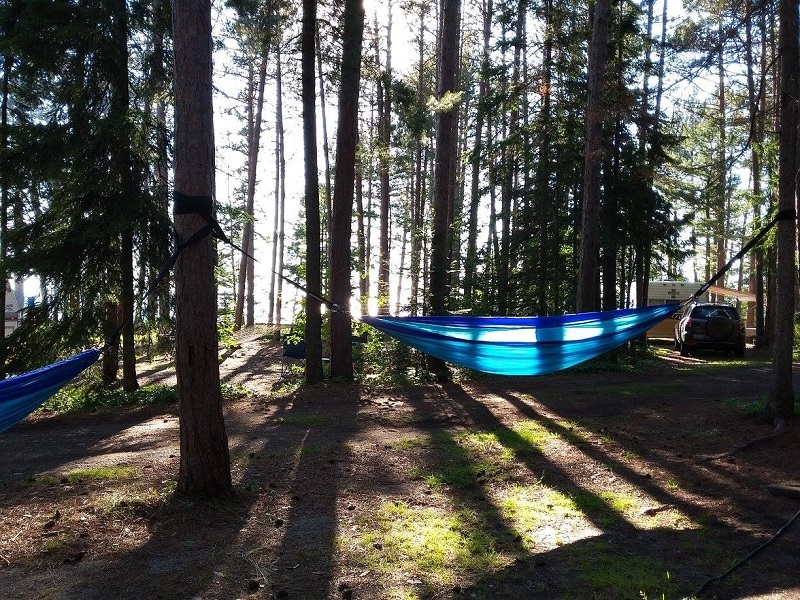 I have camped and enjoyed the outdoors since I was a child. My brother and I would spend our summers visiting my Grandparents on Rock Lake, northeast of Bruce Mines, Ontario and were very fortunate to truly experience the outdoors unlike most have the chance to. My wife and I tent camped very often before having children and have since moved to a teardrop trailer with the kids (in anticipation of a big roads trip out East/West). On my own, I have done multi-day kayak camping in remote and beautiful locations (Bustard, McCoy, Benjamin & Phillip Edward Island, Lake Superior PP Coastal Canoe route) each summer with my brother. You can follow our adventures through our facebook page Canyak Adventures. 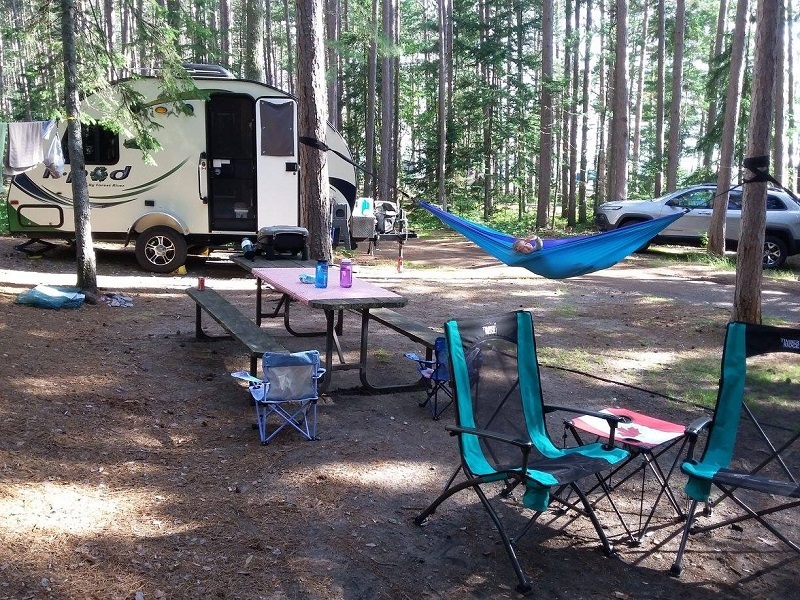 We camp as much as we can each summer with our go-to location being Pinery Provincial Park. Living in South Western Ontario, the drive is the limiting factor with two young children. 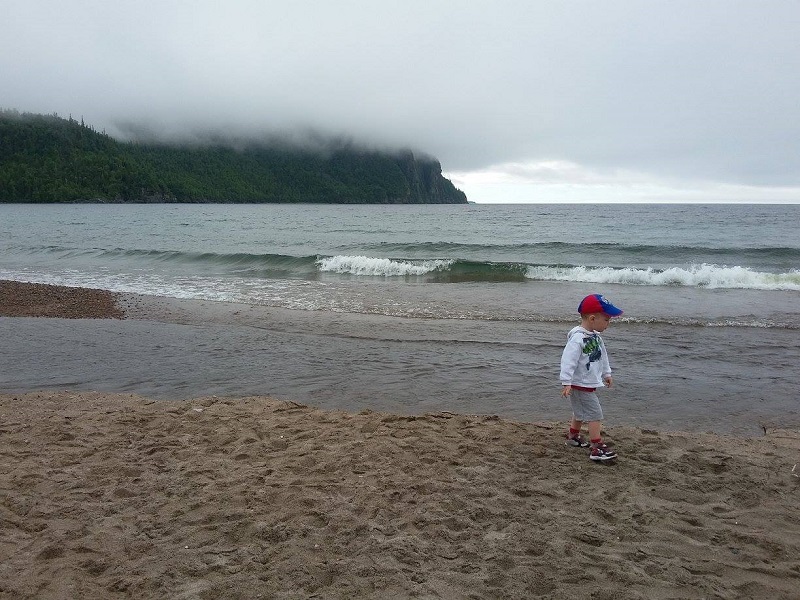 We do make it a point to try and visit at least one new provincial park each year. 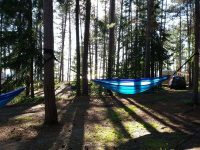 This summer we decided to head north to Lake Superior Provincial Park for a week of camping, hiking, canoeing, and swimming. We had heard it was amazing, and we definitely weren’t disappointed. Living in Ontario’s southernmost city (Windsor), the drive time can be an issue. Taking the Canadian route would cost us 12 hours. Not a fun option with a 3yr old. Cutting through Michigan shortened the road trip to a more reasonable 8 hour drive. We have made this drive many times to visit my Grandparents north of Sault St. Marie. The route through Michigan is absolutely beautiful as I-75 is mostly wooded, in contrast to the 401. Some highlights are driving over the Mackinaw Bridge and seeing the Sault Locks. 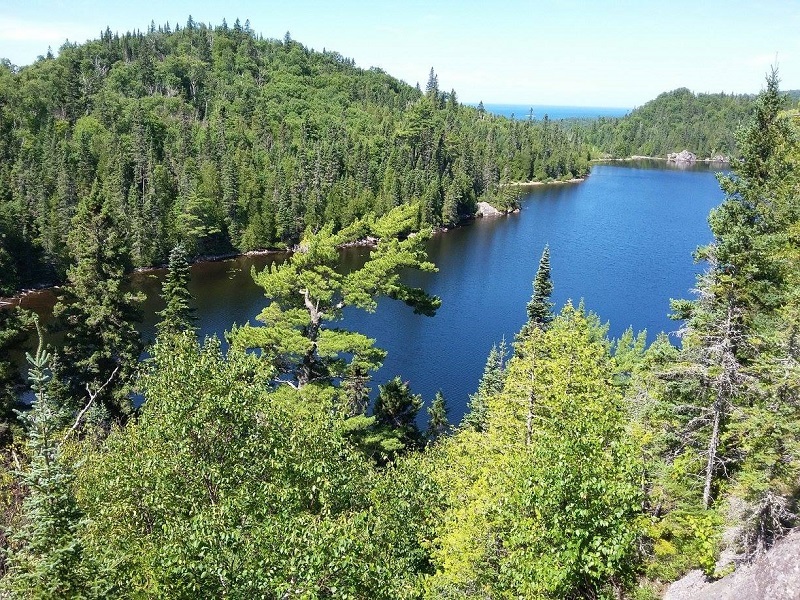 Lake Superior Provincial Park is one of the largest provincial parks in Ontario, covering about 1,550 sq kms along the northeastern shores of Lake Superior. Highway 17 cuts through the park (when the park was established 1944, there was no road access) from south to north. 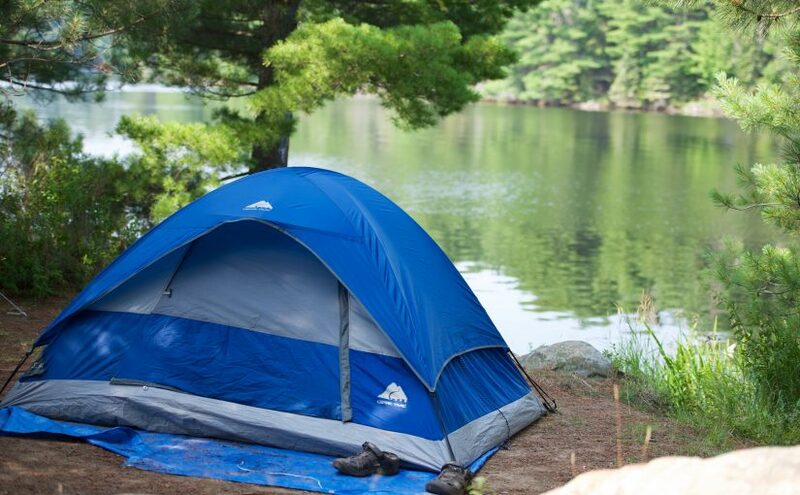 There are 3 car campgrounds within the park (Rabbit Blanket, Agawa Bay, and Crescent (currently closed)). 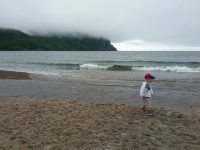 We opted to stay at Agawa Bay, but did check out Rabbit Blanket campground on a rainy day drive. There are also 200 (first come) back-country sites, and a coastal trail (which I paddled and camped along for 6 days later in the summer). The park is just massive, and we found we did a lot of driving. 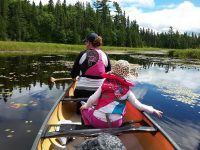 There are dozens of inland lakes, beautiful beaches, waterfalls, hiking trails and rivers to explore. The small town of Wawa is also worth the drive to check out and stock up on supplies (we did so on a couple rain days). The park has a very nice nature centre as well, located within Agawa Bay. Just a note there is no cell service within the park unless you are near the park office at the north end of the park. Beautiful lookout on Orphan Lake Trail. Baldhead river meets Lake Superior in the distance. This is the most popular of the 3 campgrounds, and with reason. 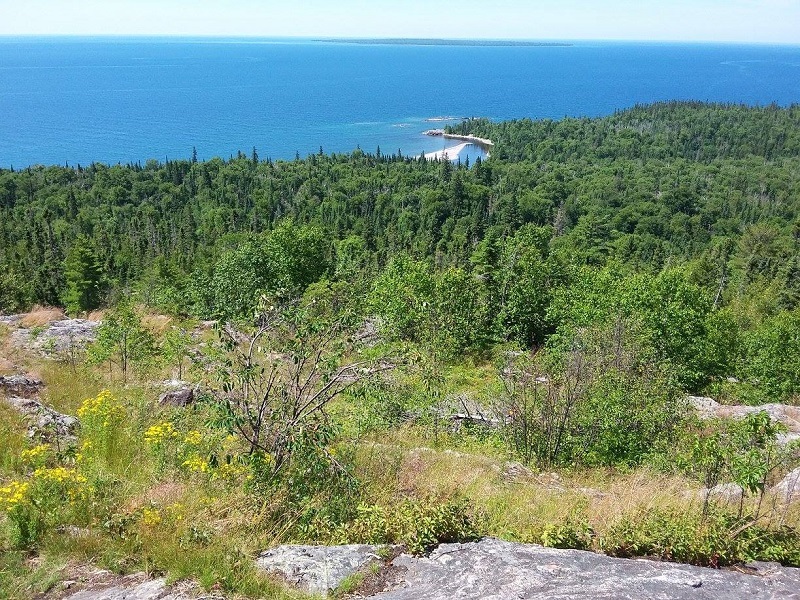 Pretty much every site has a view (although distant) of Lake Superior. It was very busy, and I would suggest reserving a site in advance. As one would expect with a lakeside campground, the sites closest to the water are best. The sites furthest away from the water are also closer to highway 17, which is shockingly close to the campground. Some people might have an issue with the hwy traffic noise (lots of transport trucks). This was probably the only negative aspect of the park. Most of the trees in this part of the park are tall pines, and therefore don’t provide much privacy between sites, but do allow everyone a great view of the water. We enjoyed our site, and the washroom facilities were clean. For us the best part was the easy walk access to the beach. Agawa Bay is rocky, but the kids didn’t seem to mind (some might opt for water shoes). The water can be rough, and the shoreline drops off quickly, so be aware with little ones. As most know the water temperature of Lake Superior can be a wee bit chilly. It was an abnormally hot week so we didn’t mind cooling off. The park offers more opportunities for adventure than anyone could possibly fit into one week. 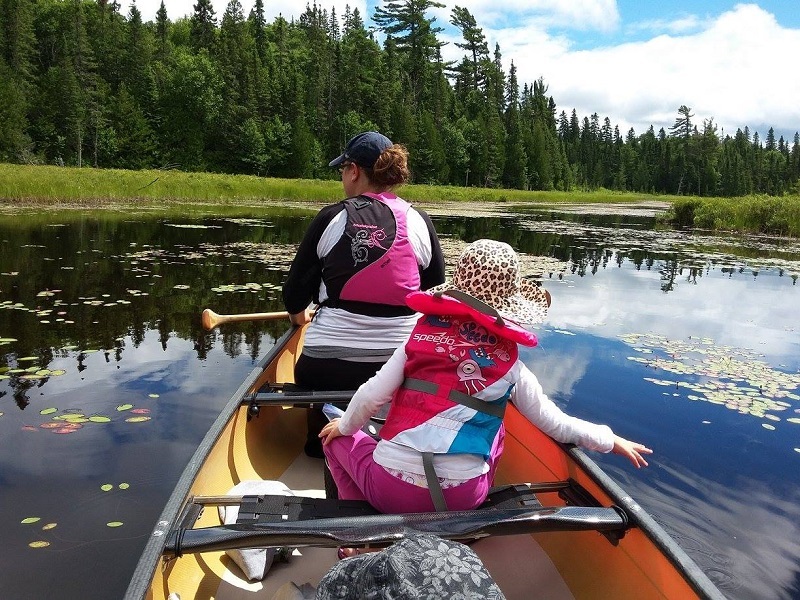 We took some sound advice and tips from the staff at the visitor centre as to which trails/lakes were must sees and best suited for small children. We hiked the Sand River Trail with its many waterfalls and it was absolutely beautiful. We also hiked Orphan Lake Trail loop, which ended up being a little tough with a 6 yr old, not to mention a 3 yr old on my back but was definitely worth it in the end. Trapper’s Trail was a nice easy hike and offers a chance to view wildlife. A highlight for us was our hike to Agawa Rock to view the pictographs (don’t skip this one!). We paddled spring fed Kenny Lake and Lake Mijinemungshing. There are so many options for paddling to choose from. You really could spend a month in the park and not see/do everything. The cobble stone beach at halfway point of Orphan Lake trail loop (8km). We were so impressed with Lake Superior PP and the beauty of the region we didn’t want to go home just yet! We decided to extend our trip by a couple days and stopped at Pancake Bay Provincial Park. This is a much smaller park, and has an entirely different look and feel to it. This park is known for its amazing (slightly warmer) sandy bottom bay. 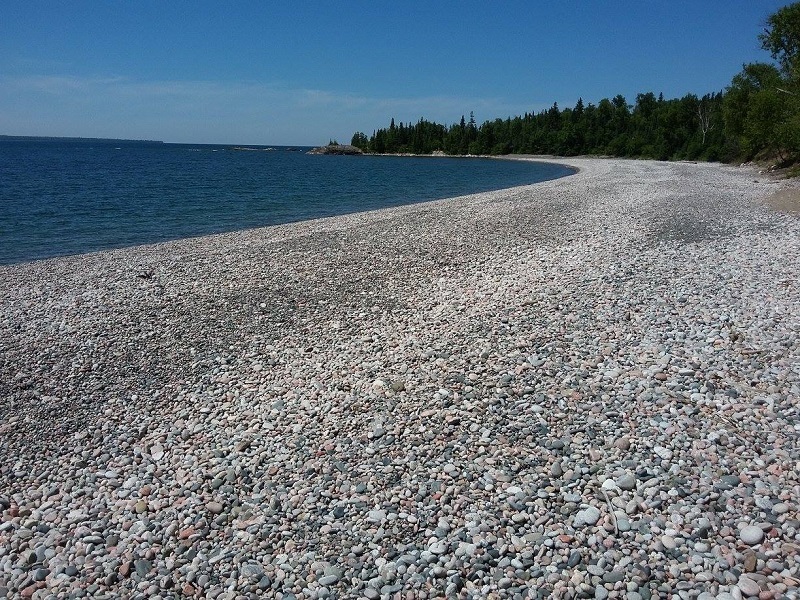 As with the Lake Superior PP, there is no need to drive to the beach, as it is easily accessible by walking. Another similarity is the campsites are very close to the (noisy) hwy but there are some premium sites directly across from the lake. 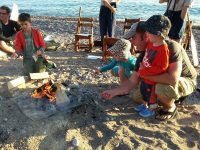 This park is definitely all about the beach and it is a quick 2 minute walk from any of the campsites. The water was beautifully clear and shallow, which is a bonus for those with small children. The Canadian Carver (general store) is right down the road. They pretty much sell everything, including ice, which the park oddly enough does not sell. While there we took a drive to Batchawana Bay Provincial Park (consists of day beach, no camping) which is a short 10 minute drive South down hwy 17. Beautiful Chippewa Falls is also a very short 15 minute drive from the campground. Overall Pancake Bay PP is a nice little park to visit for a couple of relaxed days. 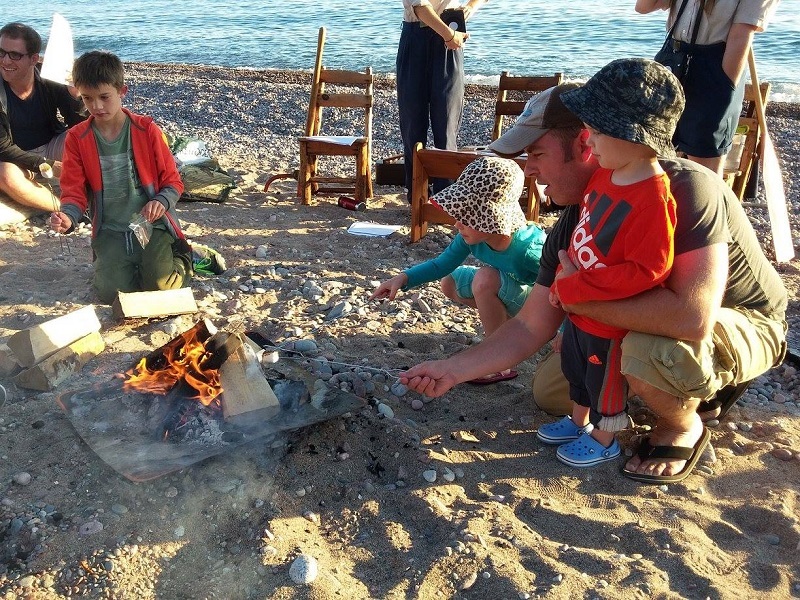 Our family did the same thing last summer and headed up to Lake Superior country. We rented an 30’ft trailer beast and took about 11 days. 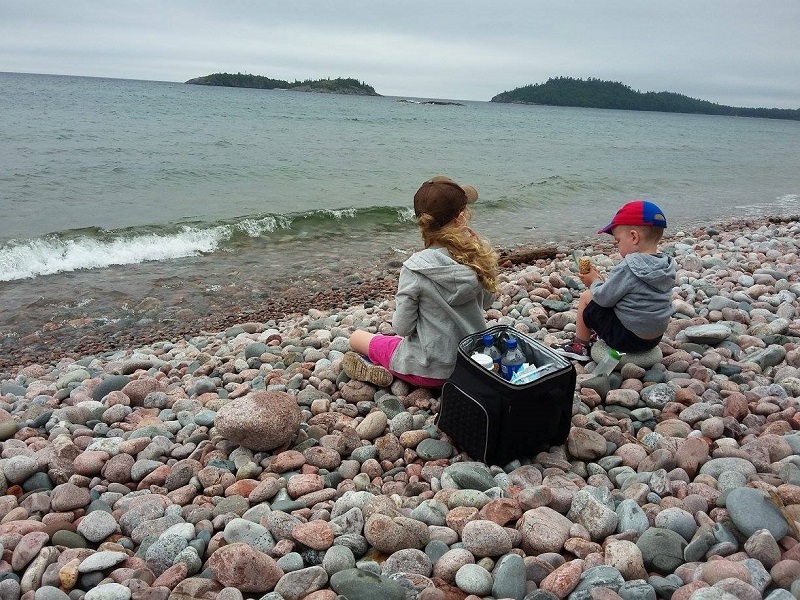 We stopped in at Killarney has a pit stop…,still one of our fav parks in Ontario. We ventured up The Crack Hike which was incredible. We then headed to Pancake Bay for three nights then went up to Rabbit Blanket and back down to Agawa Bay. We intended to get to Pukaskwa but the drive was just too stressful on my husband. We loved all three parks. Pancake Bay we took time to enjoy the big stretch of beach and stargaze. At Rabbit Blanket the kids saw the Northern Lights for the first time. We did many of the hikes. Agawa Bay was different again we forever collected pebbles along the beach. We participated in an astronomy night and looked at Saturn through a telescope. The sites at Pancake and Agawa are exposed when you have a trailer. We didn’t mind. Our trailer was an incredibly tight fit! We even ventured up to Wawa and grabbed some ice cream at the famous local store. Very worthwhile trip and i am hoping to venture back! Wow just seeing this now…sorry. Sounds like you had a great trip. On the trip above we didn’t make it to Pukaskwa either. So much driving. 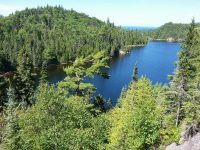 We did however do visit Pukaskwa National Park and Neys Provincial Park this summer (last summer Killarney and Killbear). Pukaskwa and Neys were amazing. Meant to get up to Sleeping Giant but the kids were done with driving. I have photos from Pukaskwa on the FB page noted in the article if you want to check it out. We spend one week up there every summer, home base is usually Pancake but Agawa is nice too. The last few years I have done a second trip with my 12 yr old and recently with my brother on Mijinmungshing Lake, TREMENDOUS experience. I am from Chatham so I know all about the drive through the states….the end result of driving along Superior is well worth the commitment. sounds very wonderful, thanks for sharing Jeff! Hey not far from us. Ya being so close to the US border really helps cut down the driving to Superior. Thanks for some tips about Lake Superior & Pancake Bay. We are in the planning process of an adventure much further West in Canada next summer, but would like to come back through Northern Ontario. 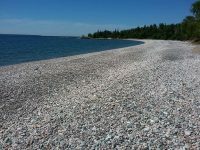 The drive along Lake Superior between Thunder Bay & Sault Ste Marie looks incredible and you pass many highly regarded provincial parks. If you had one day to experience both Lake Superior PP & Pancake Bay PP, what would you recommend? I know one day is not enough but it’s either see a tiny part of them or just drive on through! On an entirely different topic, you mentioned you back-country camp. This is something I have recently wanted to try but would really prefer to go with someone who has done it before! Any tips for newbies to take a chance in the future? The dive from the Soo to Wawa is beautiful. If I only had one day in LSPP, I would definitely start the day early hiking to the pictographs (short hike) and then grab a quick snack at the edge of Sand River Falls before hiking up along the river. Make sure to visit Old Women Bay and take a swim at Bath Tub Island (unmarked, near Katherines Cove). Personally I’d set up camp, if possible on a waterfront site in the Agawa Bay campground instead of Rabbit Blanket. The nature centre is in Agawa is pretty great so don’t miss that. We spent almost a week there, and still didn’t experience everything. As for Pancake Bay, there isn’t as much to do there. It’s known for its gorgeous sandy beach, so I’d just chill and relax on that beach all day. You might want to look into Pukaskwa and Neys (further north on your journey). We stayed at both this past summer and really enjoyed them too.